Maremmas do not need 'training' to do their work as guardian. 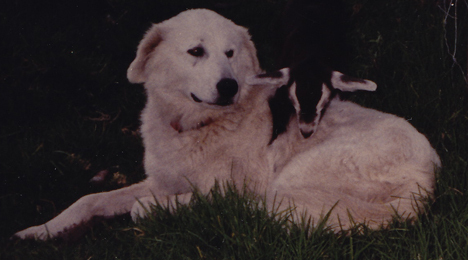 The following list are the golden rules of livestock guardian training, and are therefore very useful to remember when raising a Maremma pup as a Livestock Guardian. DO Allow your Maremma to be a full time livestock guardian dog. DO Allow your Maremma to follow his own instincts. DO NOT allow your Maremma to play with the livestock. Maremmas may however play with each other. DO NOT allow humans to play physical or chasing games with your Maremma. DO NOT allow your Maremma to be in any territory that is not, or will not become its own territory. NEVER strike your Maremma with hand or weapon except as a last resort in a serious dominance conflict. NEVER call your dog away from his guarding duties. NEVER interfere unless to save your dog from imminent death. NEVER pen or chain your Maremma as a punishment or insult. It takes 12 - 24 months for a Maremma to become a mature guardian. After reading all this information, you must evaluate your own personal situation. Please ensure that you read as much as you can here, use the search box above to find specific information on this site to become as thoroughly educated as you can. There is no substitute for making informed decisions.